Perfect for clean room equipment, the exhaust fan and duct flange for the central exhaust are installed on the side of this plastic sealing machine so the particles generated inside can be exhausted to outside the clean room area. A microcomputer controller sets the sealing conditions. A simple touch-screen operation is all that is required to set the conditions, with details confirmed on the LCD screen at every step. Optional tilt-stand and stand base available. Cost Effective and Easy for Routine Cleaning: Maintenance-friendly functions to please facility maintenance personnel. Automatic Timers: Vacuum timer for repeatable vacuum and seal timer for seal-to-seal consistency. Dual Modes: Vacuum & Seal or Seal-only mode to change with simple microcontroller setting. Sealing width: Changeable between 5 mm and 10 mm with the change of the heating element for single-side heating type. 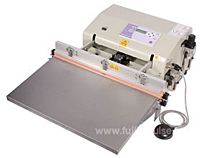 Vacuum Sealer: Maximize the shelf life. Moisture and dust proof packaging of precision parts.